Assam Chief Minister Sarbananda Sonowal interacting with inmates of a flood relief camp at Balitika ME Madrassa at Nowboicha in Lakhimpur district on July 11, 2018. Assam Chief Minister Sarbananda Sonowal on Wednesday visited the flood-affected areas of Biswanath and Lakhimpur districts to take stock of the situation unleashed by flash floods in the districts. 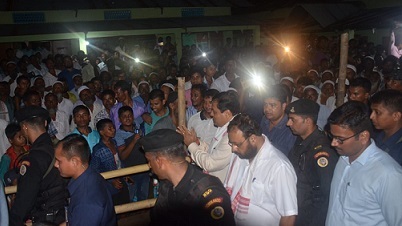 Chief Minister Sonowal, accompanied by Minister of Water Resources Keshab Mahanta and Irrigation Minister Ranjit Dutta, visited flood and erosion-hit areas perpetrated by the Buroi and Chatrong rivers in Gohpur areas. He also visited relief camps put up in the Biswanath district and oversaw the facilities given to the camp inmates. Sonowal also interacted with camp inmates and asked the district administration to put its men and materials ready to reach out to the flood affected people. He also asked Deputy Commissioner, Biswanath, Dhiraj Jyoti Kalita to intensify the relief and rescue operations. Taking into consideration of the severity of erosion caused by Buroi and Chatrong rivers, Chief Minister Sonowal directed the Water Resources Department to take immediate steps to give succor to the people. Sonowal also handed over a cheque worth Rs 4 lakh given as immediate compensation from SDR Fund to the father of Dipankar Bora, who died due to drowning. Later, the Chief Minister visited Naoboicha of Lakhimpur district and took stock of the damage caused to the National Highway by Singora river. He also directed the PWD to restore the road for smooth traffic. He also visited relief camp set up at Balitika ME Madrassa and took stock of the facilities put in place for the camp inmates. It may be noted that 1000 camp inmates from 216 families have taken shelter in the relief camp. Gohpur MLA Utpal Bora, Biswanath MLA Promode Barthakur were present during the Chief Minister’s visit to the area.